Online OCR services are very useful if you are planning to extract text from images and pdf etc. Below is a List of Top 20 Free OCR Services Online, which are free of cost to use them online. With the use of these online free OCR websites, you can easily perform the optical character recognition services online without the use of paying and downloading any crappy OCR Converter tool. We believe that one should always look online for any software alternative as most of the things can be done online easily. 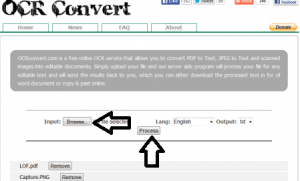 You can easily use these Online OCR converters without the use of registering. Just upload the image in google drive and right click on the uploaded image and open with google docs. It will show the image at the top and extracted text at the bottom.Apart from all the above-mentioned processes, there is another process or method that helps perform OCR on the images and also on PDF’s, only by using the Google drive. A very easy process to do, the file containing the image or the PDF needs to be uploaded to the drive. When the drive is opened from ‘drive.google.com’ in the browser, the files that have been uploaded is seen. The preferred file needs to be selected and on right clicking on the same, ‘Google Docs’ is chosen from the sub menu ‘Open Menu’. When the file opens, the image or the PDF document will display a blue border and a text at the bottom of the page that can be edited. Now the resultant text can be selected and copied for the desired usage or can be downloaded entirely to the local drive on the computer. A user friendly and free online OCR converter tool service to extract text from picture and that is available free of cost at the internet, help in doing Optical character recognition online. Files up to sizes of 5 MB can be uploaded for conversion. The user gets a long list for selecting the desired input formats, like JPG, PNG, PDF, BMP, TIFF, PCX, GIF, and ZIP. Some of output formats that are supported here are Microsoft Word (DOCX), Microsoft Excel (XLSX) and Plain Text (TXT). It can OCR the inputted files in three distinct steps. The first step includes selecting the file and then in the next step the language and output formats are selected. You can select namely any langauge in the world like french, Russian, english, arabic,German, Chinese, dutch etc. Lastly, in the final step, the conversion is done by clicking on the convert option. The output text can be screened before you want to download the same. Even free account registration is available for getting more and more utilities. Windows users can download this free useful photo scan app from windows store which can be used to convert text from image. Just download and install this app on your windows PC and open any image through it. It will instantly display the extracted text on the right window. Another example of a free online OCR service, that is free of cost, helps in distinguishing the text from other scanned documents and convert multiple pages at once. This service enables conversion of JPG, BMP, PNG, GIF, TIFF, PDF, DJVU, ZIP, and many more, into a text format that can be easily edited. The input file can be easily chosen either by pressing the Browse option or by providing the URL of the particular file. The Preview option is then clicked on for starting the upload and preview of the main file. A that point, the language, set rotation,. Etc. can be selected. After this, the OCR needs to be selected for the process to begin. As soon as the process is completed, the extracted text can be seen in the text portion. 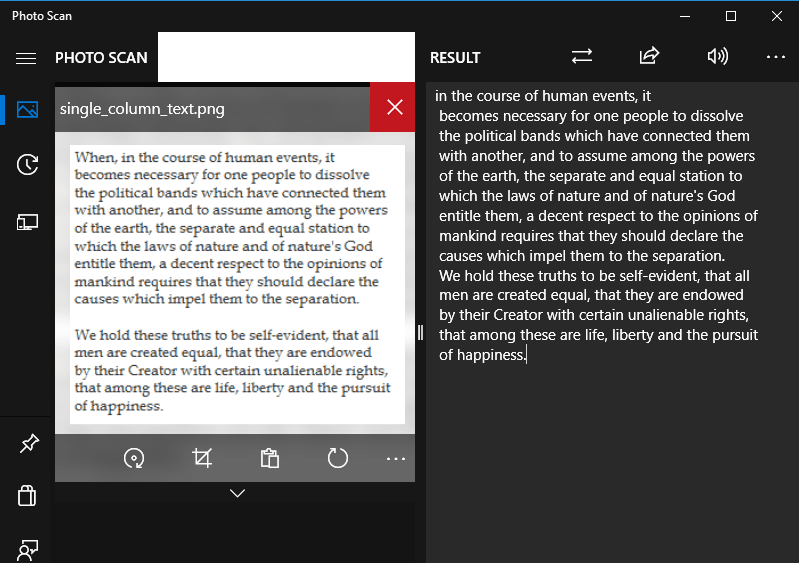 Now you can actually download the text in the form of Plain Text (TXT), Microsoft Word (DOC) or in Adobe Acrobat (PDF) format on your computer. The service can support for an extra 75 different recognized languages. Free-ocr.com is an example of another free online OCR converter service that can help in extraction of text from scanned ones or multiple images that has text inscribed in it, in the form of an image. No email addresses are required for using this service. Some of the formats that are supported are JPG, BMP, TIF, GIF and PDF. Any of these given files could be uploaded of size 2 MB, within 5000 pixels and ten images at a stretch per hour. Now the user has to select on image option, then select language and then enter the CAPTCHA that is given. After pressing on ‘send file’ option, the process starts. The obtained text can be used for editing on needed. 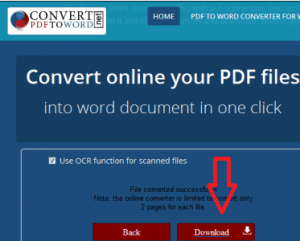 The user-friendly free online OCR converter tool available on the internet helps in conversion of scanned text and document or images into files that can be duly edited and searched. Different types of input file formats are supported by it, that includes JPG, BMP, PNG, TIF, and PDF and the output formats include DOC, RTF, PDF, and TXT. On pressing the Browse option from ‘select your image or PDF file’ tab, the input file is selected. The drop down list helps in selection of output formats. Lastly, the process begins on clicking on the convert option. A link is available instantly on the same page that helps in downloading of the same. This particular Free OCR online website helps in easy online conversion of PDF file to word file and even OCR is done by it. The OCR can be performed on scanned PDF files by pressing the ‘use OCR function for scanned files’ option. Then the output format can be chosen from a list of formats that support it. Some are mentioned here like the DOC, RTF, TXT, PDF, DOCX, XLS, XPS and HTML. Then the input file is selected on clicking the Browse option and chosen from a list of formats like PDF, GIF, JPG and PNG. 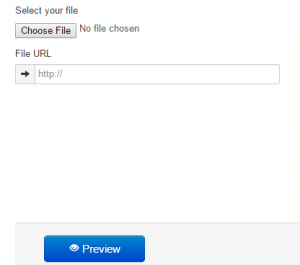 The newly formed file can be easily downloaded once the conversion is done. A maximum of two pages can be supported for each file. 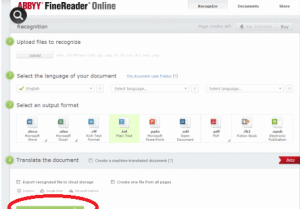 The popular Free online ocr service for performing the OCR online is finereaderonline.com. All the scanned texts and documents can be converted without a problem and that too for free. You can use a ten page credit limit for a 15 days when doing registration for a free account. The document that is converted in this process is of high accuracy. Some of the input formats that are supported are PDF, JPG, BMP, TIF, PNG and many more and some of the output formats that can be supported are DOCX, XLSX, RTF, TXT, PPTX, ODT, PDF, FB2 and EPUB. The inputted document can be converted to a word document or text file into its edited form with the use of some easy steps. The website even provides a choice for translation of the transformed document into some other language. 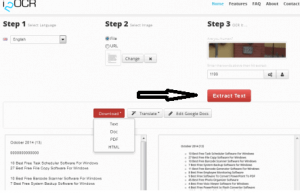 In this Online OCR tool site The scanned form of the PDF files and any image formats that can be supported are converted to text documents that can be easily edited. The OCR in huge file size is supported and even multiple files can be selected and then the OCR can be performed on each one. The Browse icon is selected for the file selection and then added to the process list. Then the language can be chosen for the input file. The process option is selected for the upload and OCR procedure. After the work is done, the link for downloading appears on the page. One of the necessary internet Free OCR service provider is i2ocr.com that can convert the scanned images of the text document into some document that can be edited by usage of this particular website. Some of the image input formats are as follows : JPG, TIF, BMP, PNG, PBM, PGM, PPM, etc. while some of the output formats that are supported by it are TXT, DOC, PDF and HTML. The language for the input is chosen by firstly the selection of input file or URL. Then the displayed CAPTCHA is to be written down and pressed the ‘extract text’ option. When the OCR is finished, the result is downloaded in one of the given output formats. It also supports an additional 60 acclaimed languages. A very easy to use Free OCR website that helps in processes of OCR. Any type of images of text document can be converted to documents on usage of it. No additional registration is required for this type of service. The main benefit that it provides is that, the time for retyping is being saved and it also provides extra 40 acclaimed languages. For selection of the input file, the language needs to be selected and then the Browse option needs to be clicked. Just when the image file is selected, the convert icon needs to be pushed for starting the process. The entire converted text appears on the screen and hence the user can download the same to TXT format on the PC, on requirement. One of the free Online OCR service that helps in converting, compressing and OCR of the documents or the images into the PDF format. This is done by selecting the task (over here the main task is OCR) and then by clicking onto ‘upload files’ option. Some of the input formats that can be supported by this service is given as follows – PDF, TIF, TIFF, JPG, JPE and BMP. After this step is cleared, the files become ready to be processed. The resultant and the converted PDF files could be downloaded at ease, only after the person would provide the necessary details. 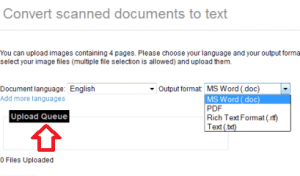 It is a free OCR website which allows the user to convert scanned documents to text. Over here, a free account needs to be opened by the user firstly and then after he has logged into the account, the input file can be uploaded. Now the input document language has to be selected and also the output format. Some of the supported formats are like the DOC, PDF, RTF and TXT. Just after the file gets uploaded, the file should be selected and finally the process option needs to be clicked. Now when the process is completed, the file can be downloaded from the link that would be provided. Some of the supporting input formats are as follows, PDF, JPG, JPEG, TIF, TIFF, GIF, PNG and BMP. At a stretch, five pages can be subjected to OCR under the free account. The convertimagetotext.net is another example of the FreeOCR conversion and text extraction on the internet that helps in performing the OCR service online. The site supports a lot of input formats like the PDF, JPG, GIF and PNG. No cost is availed on conversion of two pages per file in cases of PDF format. Some of the supporting output formats for the same are DOC, DOCX, RTF, XLS, TXT, XPS, PDF and HTML. The final outcome involves a time limit of just a few seconds, after which the download of the output file can be duly started from the link that would be provided on the screen. The above-mentioned website is an online free OCR service provider. Texts can be captured from the images and pictures just by uploading the file. The input formats that are supported by the website are JPEG, PNG, GIF, BMP and TIFF. The input file needs to be selected by clicking on the Browse option and then the language is chosen from the dropdown list. The process is finally started on pressing the ‘upload and convert’ option. 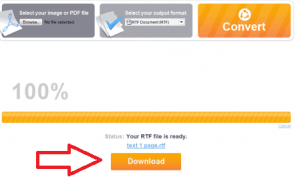 The TXT file can be easily downloaded after the process ends. The captured text can be used for to word processing applications. It is a free online OCR service that helps in extracting scanned PDF file online. The scanned PDF can be duly uploaded and an editable format of DOCX file can be obtained in the mail. The PDF file needs to be uploaded first with the email address and just by pressing start, the process thereby starts. An email is received by half an hour that has the URL of the converted DOCX file. The text which appears as a result, has a very good quality of it. The website helps in performing online OCR on the PDF files and on different image files. The files can be uploaded in the given area and numerous files also can be uploaded at stretch. Then just by pressing the ‘start OCR process’ icon, the extracted text is displayed on the computer display. The file can be downloaded or copied later and even the combined file can be downloaded, if multiple files are uploaded. A user friendly website that helps in conversion of scanned PDF files to online word file. ‘OCR Text Recognition’ needs to be selected from the convert method. After that, the language of the input file is chosen and on clicking the convert icon, the process starts. After the completion of the entire process, the extracted file could be downloaded following the displayed link. PDF file of sizes exceeding no more than 8GB is allowed here to for upload. Many languages are considered for extraction, like the English, French, Italian, Arabic, Dutch and Spanish. This particular website does online OCR in huge amount. Numerous files can be uploaded at a stretch and batch OCR is performed on them. For selecting the file, Browse icon is to be selected and then ‘add file’ option is to be used for inserting more and more files. After clicking onto ‘extract text’ option, the uploading starts. The files would be subjected to OCR and the texts get converted to TXT formats. Finally, the TXT files can be downloaded from the displayed link. Some of the input formats that are duly supported by this website are JPG, PNG, TIFF, PDF, GIF, BMP, and DJVU. Online OCR is a free service by a Tech Blog which lets you upload the image file via its upload button and convert the file to words. It claims to be fastest of its kind and is a new child on the block. I haven’t used it, but i feel it is kind of accurate service to use for. 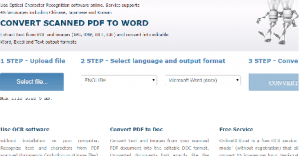 Scannedpdftoword is a online service by a software maker. You can choose to use its service online where you can convert pdf document to word for your use. It has a minimal interface and is super easy to use. You have an option to leave the check box unchecked which is recommended if you do not want to receive promotional mails each time you open the inbox. The full form of OCR is Optical Character Recognition. The list which is represented below shows the finest 18 online OCR services that are free of cost. They help in doing OCR on different types of files that has images or PDF’s in it. They can be even converted to documents that can be edited from their scanned ones. The presence of the particular browser is important and not any additional software needs to be installed for using all these tools. They have some vital characteristics in them, which includes the easy uploading and downloading and also helps in completion of OCR in bulk mode. JPG, PDF, PNG, GIF, BMP, and ZIP are some of the supporting input formats, while TXT, DOC, DOCX, PDF, XLS, XLSX, HTML etc., are some supporting output formats which would provide the link of the converted file on the webpage, but the other one would transmit the link to the email address and even has many sorts of languages like the English, French, Italian, Arabic, Dutch, Spanish, etc. which is supported by it, for OCR process. I just launched http://ocr.net as a free online OCR service. It supports most major languages and converts scanned images and PDFs to text or searchable PDF. It is powered by PDF OCR X in the back-end.